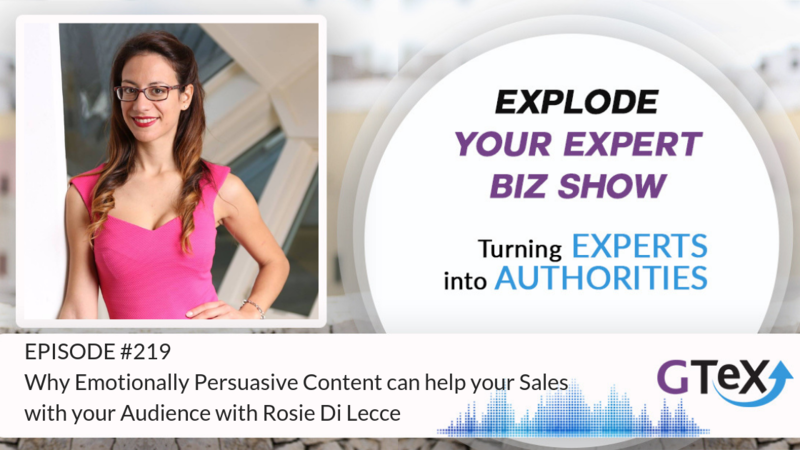 Rosie Di Lecce is a Persuasive Content Expert and Coach. She’s the CEO of Saia Creative and founder of Writing with Rosie. 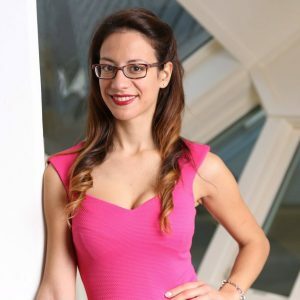 She works with businesses struggling with their core message and the creation of powerful content that will help them get closer to their target audience and increase sales. – And welcome! To another episode of Explode Your Expert Biz Show, and today I am here with the one and only, Rosie Di Lecce. How you doing Rosie? – Hi Simone, how you doin’? I’m doin’ okay, you? – I’m really well, thank you very much. We started this conversation in Italian before, when we were behind the scene here, and we started laughing, probably because of accents. I’m very bad with accents, I know. – It was.. Well, if you think so I trust you Anyway, let’s move on, let’s start with the topic of the day, which is about emotional copywriting. Before we go on to that, Rosie, what’s your background? Why did you get into copywriting and in particular, emotional copywriting? – It’s a long way, to be honest. It started all with, I guess, just like passion for languages, and a passion for english. I taught myself english when I was seven or eight and that was through music. I was very excited about it. Then, I just started, kinda nurturing this passion for languages and then that journey to passion for writing. Then I went on to university, and actually, I studied something that was related to this, which was linguistic mediation and cultural mediation. It was very interesting, because it gave me a different understanding of how language and communication work. Then, after that, I moved actually away from Italy. I moved to The Netherlands, and I started working in marketing, as a content marketeer. At that point, I was developing this new skill, which was marketing, but at the same time I would still keep on writing and I could still use this background in languages and cultures to actually create something that was unique. That of course put together with a talent for writing kinda turned me into a copywriter, and that was the beginning of it. It was very accidental in a way, because I had no clue what I was doing, but then through my career I actually developed into copywriter. That was for me, such a, such a great moment, you know, to understand that actually I was a copywriter. Because if I could put together my passion for writing, my skills, you know, in languages, and at the same time this creative note, and also a little bit my natural talent for selling. I thought wow, this a perfect combination for me. That’s how I became a copywriter. – I’m just curious about one thing, because we’re both from Italy, so we both had to learn to read, to write and speak into different language, which in this case is english. I remembered when I started writing copies and started understanding marketing, oh my god, it was such a pain for me. That, particular for the language barriers, so how did you, was it easy for you, adapting to write at a very high level in a different language or was it difficult? How did you do that? – I guess it was easy because of my, again, like of that sort of passion for english. Well, I say passion, it was more like an obsession. I was obsessed with England. I was obsessed with London. I was obsessed with having a British boyfriend, basically that was in a band, or something like that. Yeah, that was me at 15. Basically, I started writing very very early on and every time that I had the chance, I would always find a native speaker of some sort and just ask them to actually check whatever I was writing. Already, when I was 14 or 15, I had this level of grammar that was not average, you know, for Italy. Actually, I had also a bit of an issue at school because at one point, I had a teacher that would punish me by giving me a lower grade. Because she said that I was doing things that were not according to the course. They were just like a higher level. – That I think, just kinda prepared me for it. Then, from there I just developed more and more. It became very very easy to then take that and just turn it into something professional. – That’s brilliant, that’s brilliant. Tell us a bit more about what you are doing now, what are your projects that you are working on at the moment? – Disclaimer, and NDA’s and Otherwise, they have to send someone and kill you probably. – Maybe, like a ninja coming into my room right now, or something, so yeah, yeah. – Alright, so it’s really fascinating. I believe that copywriting is a skill that every entrepreneur must have, because it is, not only related to the written language, but also to the spoken language. I’m obsessed, as you know, about sales conversion and that’s why I went into copywriting. Not necessarily because I like writing actually, as you know, I’m, I happily give it away when I can. I’d give it away to you when I can, but when it was so crucial for me to understand it. Because otherwise, if I don’t have that skill I will always be relying on someone else, even to send a persuasive email, or to get someone to buy from me, and so I understood the importance of this skills. We’re talking about emotional copywriting, what is emotional copywriting? – Emotional copywriting is a concept that I came up with a while ago, when I realised that, copywriting, the way that it was intended it’s always been something that had to trigger some sort of emotion in people. But at one point, because of, you know, this whole search of the new economy, the geek economy, and everybody started a business. Basically copywriting was becoming something extremely sales-y and extremely spam-y,very badly written, and emotions were completely left out, and if emotions were in a copy, then it was mostly negative. At one point, from my experience, I started to think more about this, and I thought, well, there must be another way of doing it. The other way of doing it was, again, to tap into that emotional layer and to turn it into something positive, first of all, for the audience, but specifically, to go even deeper. I always say, I think about the problem or the challenge of the audience, then the emotion that they feel is connected to that, and then I take you once step further: what is really the emotion behind that problem. That’s what really makes it powerful, because we can all say, oh okay my business is failing so I am frustrated, but what is really the feeling or the emotion behind that frustration. What is it that people are really feeling? Is it failure, is it something else? Is it that they feel then unhappy, they feel worthless, what is it really? Once you get to that understanding, that’s when you can create copy that is actually emotionally strong and then it’s going to convert for you. – Is really understanding the emotion behind the problem or the frustration. Because I think you mentioned something here, they find that there are lot of copywriting and lot of copies and sales pages that they really trigger a lot of negative emotion and there is a lot of negativity, almost like triggering a sense of guilt to get someone to buy. The curiosity that I have, the curious thing I have is, because emotions are so powered, particular negative emotions are so powerful, is that, like where is the right balance? Does it work, does it still work really putting on a lot of negative emotions? Is it something that we should do? Is it something that we shouldn’t do? What’s your take on that? – I think it depends of course on, also, the product and the industry and all of that, but there has to be, or there can be a balance between the two. Of course, sometimes, negative emotions can work, but people are starting to see through it. That’s more the problem in a way. See, people are becoming more and more aware of these marketing techniques, and they don’t want to feel that you’re fooling them, they don’t want to feel bullied into buying something, they don’t want to have regret after doing it. So, you can still leverage a little bit of that negative emotion, but the most important thing is that when you’re writing copy you talk clearly about that dream outcome and that great feeling that they will have after that they have bought your product, your service, or whatever that might be. You can still touch on on that negative feeling, because they still need it sometimes, to have that, sort of, before-after effect. But, it’s something that shouldn’t be the main focus in a copy, because that’s when people are just going to see through it and they’re going to feel very off about it. If you have something that’s very negative, you just kinda leave your reader with that feeling of, my god my life is gonna end, and I don’t know what to do, and I don’t have money to buy this, and oh my god the world is ending. This is not gonna really work with them. – Yeah, yeah, absolutely. Now, I have a question regarding people that don’t like, or maybe they’re quite new, because we have two kind of people listening to our podcast. We have someone who is pretty new and we have, they’re starting out, and then we have the expert that’s been in business now for many years and now they’re looking for the next level of skill. Before we are talking to the next level of skills and more the details of copywriting, for the people that are being new to this kind of word, and to copy, and saying, oh my god I don’t have a, really a clue of where to start? I mean I can do, I can open the page, I can open my word document on my laptop and then all I can see are like birds flying around and a blank page, and I can’t really put down any word. So, someone is at this stage, what is your recommendation, where is the starting point? – Hire somebody to do it for you. If you can, that’s the best. If you can’t, that’s also okay. Actually, as you said before, I think that everybody should learn the minimum skills of copywriting, you know. What they can do is, first of all, remove that sort of fear about writing. There is nothing so great or so precious about writing, we all can write, it’s just the matter of knowing what to do. First of all, remove that sort of block, because it’s a mental block as well you know, just remove that. The second thing is, really focus on, exactly what I was saying, really focus on who’s your audience, what kind of clients of do you have, what is really their challenge, and what is it that they are feeling? Try and get that sort of understanding and then just go ahead and really start typing and go for it, because I think that a lot of people eventually will, you know, they actually give writing a try, they will realise, okay actually this is not that bad. Then, it’s just a matter of tweaking and understanding how to leverage down emotional pull in a way, or that emotional layer to what you’re doing. Really try not to think in terms of, I really need to make a sale through whatever I’m writing, but actually just think, okay what can I do today that will impact, or what can I write today that will impact my audience. If you think about it that way then you will naturally give them a solution to their problem, you will be much more prone to deliver value as well, because that’s, you know, it has to be there, and it will just happen. You know, it’s a matter of just getting started, and then you can always learn more, read more, you can follow different copywriters online, right now, there is always, you know I always share a lot of volume on my Facebook. There is so much information out there. It’s always something that you can learn and get better at. – Yeah, there is a couple words I will love to share about, with this people, that, it’s kind of as you said, this block where they think that, what they put out is not good enough, or there are a lot of spelling mistakes. I mean, listen, you probably opening, if you are listening to this show, maybe you are opening some of my emails and reading some of my social media posts. I always have someone commenting on a spelling mistake that I make, but I’m not an english teacher. That’s the point I want everyone to understand, I’m not an english teacher, and english grammar is not what makes me money. English grammar is important when you’re writing like important sales pages, I agree with you, in fact, I have someone that proof reads all the pages, they were, when you were creating the pages, are perfect. But, for the content that you’re putting out there, even if there are some mistakes, that’s okay, I mean content with some mistakes is better than no content at all. – If that’s one of your blocks and then the more you write and the better you become, and also, there are different tools that you can use to help you with grammar check as well, we can talk about in the end. Now, you started conversation, so still around the emotional side of it. That’s something that someone who is starting out can think, well but, I have an idea of my clients, but how do I know, or how do I start a process of understanding what emotions are they feeling? Is that something that you do, Rosie, when you are writing for someone, to and help them, make sure that you actually write about the right emotions, and the right thing, instead of just, hmm maybe I think this is what they’re feeling? – Well, first of all, just talk to your audience, that’s the best thing that you can do. If you have already clients, I always say, to my own clients as well, get on the phone with those people. Just pull out some post that says, I need to talk to this kind of people, and just actually talk to them and try to understand their frustration. That will help you, because it’s going to remove that sort of, guess-factor, so you don’t need to say, oh maybe it’s this, maybe it’s that, just actually talk to them first of all. The other thing that I do, and this actually something that, something my client told me. He said, I keep on asking him, but why? So, if somebody is feeling this way, or somebody has a certain problem, why is that, and why are they feeling that way? Always question whatever that challenge might be for your audience and try to understand really deeply, but why? Again, I’m gonna go back to that example of, you know, I am a business owner and my business is not doing well, I want to improve. If you’re selling business strategy services or whatever, always ask your audience, okay but why are they worried about their business, why do they want more, why are they frustrated about this. Always ask, but why. That’s going to get you really to a level of understanding that is very different, because then you’re not just, again, guessing, but you’re also looking really further into why they are feeling the way that they are feeling. – Yeah, this is so, so powerful. What you’re saying is, basically, don’t be afraid to check in with your audience, ask a few questions. Because from what I’m hearing you say, it feels like that the audience gives you the answers that you need, to then sit down, and write about it. – Basically, yes. It’s why, also, when I do copy for my clients, the first thing in my process is actually to sit down with that person and spend an hour with them, just chatting to them, understanding the kind of language that they use, because that’s also very important. Understand the language that they use. Understand the way that they define their own problems, and the way that they talk about the solution, and understanding their emotion behind it. It’s something so important and your audience definitely has all the answers when it comes to copy. – Let’s talk about the language now, because that’s also another problem that I see that a lot of people that are having, or they are saying that they have. Which is, but, what, how should I write? Should I write in a formal way? Should I write in an informal way? Should I write as I talk? Should I write in a more, like it can be quite confusing. Because I remember, like you know, when we were at school, we were told, okay, you do the essay and you have the formal essay, you have the informal essay, you have the day out with your parents, whatever it is right? – I think there is this conflict in people, what kind of writing style shall I use, and what’s your recommendation on that? – Again, it goes back to the audience. I always say, you can be as formal or informal as your audience is. If you are talking to an audience that feels very formal, maybe they are, you know, people that are not in corporations or whatever, you can be informal. If that’s the way that they are. If they swear, you swear. If they use slang, you use slang. So, really adapt to your audience, again. That goes back to it, but also I think there is another element to it. You cannot just talk in the way that your audience talks, because that would also not make a lot of sense, I guess. But what you want to do is also, really to think, okay what kind of voice do I have, and how can I infuse that voice into my copy. There is that, sort of process, that you can do of asking yourself, okay, what kind of personality do I have? Talk to your friends, that’s something that I actually did in the beginning of my business. I was talking to my friends, and a lot of them were pointing out that I am a bit quirky, that I can be funny, I can say things with humour, I’m very nurturing. I thought yeah, that’s pretty much me, and that’s the kind of voice that I also want my audience to know. – When I start writing for myself, my own business, I always try and focus on, okay, am I coming across as nurturing, am I still showing that quirky side or am I adapting too much to the trends. Because sometimes it does happen. You know, maybe we see something and we think, oh that’s so cool I’m gonna try it. It usually just fails, that’s not the way that it works. Always just make sure to ask yourself, what part of my personality do I want to show my audience, and how can I channel that inner voice into the writing voice. It’s an interesting process, and it’s something that will take time, but it’s definitely something that you can do and it will change your copy drastically. – Exactly. Now, I want to talk about more if someone is a bit more advanced. Let’s say now, we have probably listeners, that they, okay, they’ve been writing for a while and their pages are conver-tish-ing, but not too, but they can be improved. When you are looking off something that is already working and to make it better. From a copywriter point of view, or someone, I want to review one of my own pages, what would you suggest me to do in that situation? – First of all, start with copyediting process. Read out loud whatever you’ve been writing and really let your brain do the works. As in, it’s actually quite of a funny thing, but your brain can spot a grammar mistake, or can spot if something is a little bit off without you really realising why it’s off, but your brain knows. If you read it out loud your brain will have that sort of awareness of, wait something here is not really working, lets see what we can do about it. That’s the first thing that you can do. – Ah, that’s so cool. – Read out loud, yeah, it’s very cool and it’s actually, it works so well. The first thing you can do is go ahead and take that copy, read it out loud and try and see if something is off. If that’s the case, just change it. The second thing that you can do is always ask yourself, can I say the same with less words. Because, a lot of the times, the problem that I see when it comes to sales pages, for example, is that people try to say something in a very complex way. We end up using 100 words for something that could be said in probably, just about 60 or 50 words. That’s really off-putting for the reader, because sometimes like we get so caught up in that confusion of words, that it’s like, okay what are you even trying to tell me? – What’s the point, exactly. That’s a very good way, to just like change your copy and make it work better. The other thing that you can do, is again, just look at that emotion. Just to make sure that it’s very very strong from an emotional point of view. Then, it’s actually funny that you’ll use this question: what’s the point? This is actually a question that is key whenever we are writing. We always have to ask ourselves, what is my point? What kind of point am I trying to make with all of this? Because, what you will realise is that something that we write, often, has about three, four, five points, all in one, and that’s so confusing for your reader. Sometimes, you really just have to take a moment and ask yourself, okay what’s the point of this? Then, if you can just define that one thing that you really want to communicate, that’s when, actually, your copy goes to the next level. -It’s like, okay, yeah I understand I gotta have a core message, but how can I find it? When you work with your clients, what’s the process that you use to help them find their core message? – So you’re not beating them up? – No, exactly What I do, with a lot of love and nurturing, is that I always just make them think about why are they really into whatever it is that their doing, and what is it they’re trying to really communicate and change. A lot of that, again, goes back to that silent layer of language. The way that I see languages, or cultures in general I guess, is like an iceberg. The way that we use our words, the way that we talk about things, is that tip of the iceberg that we actually see. Then, the meaning behind every word and the meaning behind all the communication is usually the part under water, that we just do not really see at first. I always tell my clients, okay you can say, for example that, the message that you have is, you know, I don’t know, somebody should do self-care and put themself first. But is that really what you’re trying to say? What is the meaning behind that? What is, again, like that sort of emotional layer to it, and what are you really trying to communicate? There is again that sort of search, like you know, deep searching. Some people find it very confronting, because then actually they realise that it goes back to maybe something that they went through. That’s the case with a lot of coaches of course. Maybe they realise that there is the one client that they helped that really changed the way that they were seeing the work. There is a lot of, you know, ask yourself really what is it you’re trying to pass on, and what is that you’re really selling. I can say I am selling copywriting, but that’s not really true. The way that I see it, is that I am selling the possibility to have a voice and that’s something much more powerful, you know. When we talk about, yeah, there is a lot of talks, of talk about the messaging and whatever, but yeah a lot of people struggle with it. I think a lot of people still don’t understand that. Because there is so much noise out there, the only way to stand out is actually, to have a strong message. A message that can help you connect emotionally on a deeper level with your audience. If somebody feels understood, if somebody feels that there is that, sort of empathy level and that they can trust you that’s actually when people will open up to you, and they will buy from you. That can become your differentiator. Probably, if you have like, I don’t know, marketing agencies, there are so many of those out there, you know. But, if somebody can actually see, hey this person is different, because maybe they have a different value or a different message, something that I can relate to. That, they probably gonna choose for that one particular person, even if there are thousands of other options out there. – At the right moment. – Well, I think that’s exactly what happens to a lot of entrepreneurs. A lot of the people that come to me, they might be starting out, some of them have been already in business for a while, and they feel that they are not sure about what their message is. They go exactly through what you described, and I think that, to have that message, is also somehow connected to your purpose as well. It’s always connected to, if you are aware of it, now you can communicate it better. You know, it’s something so powerful, and it’s something that I think it’s great that you find it now after six years, you know, better late than never. I think it’s something that people should become aware of as soon as possible, because that’s going really to make you stand out. It’s going to, probably, even change the direction your business goes at one point. – Sure, I completely agree with you. I think in this scenario that I had, in my scenario, I had different purposes and I know what g-decks, like I knew why, but I’m gonna be spending more and more and more time by myself, and just thinking. The thinking it just goes through different layers, and that’s where, it’s like, another layer It’s like, okay this is the rehab, but we’re not here talking about that. I’m still quite fresh from the so that’s why I wanted to share. Rosie, before we hang up, and thank you very much for the brilliant interview, absolutely love it. It’s time to lift the veil, that’s the part of this show where I ask my guest to share something, like a tool or an app or maybe a book, that they’ve read recently that is making a difference right now in their life or their business and is worth the sharing. What’s that for you? – Okay, so this is a very difficult question, because I go through tonnes of stuff in my time, so it’s like what do I think actually. But, if it comes to business, I would say something that, it might sound very common in a way, but for me, it was very very important, to have at one point this app, that is called Evernote, on my phone. I always told my clients to go ahead and use it, because it gives you an opportunity to actually always just write down all these little notes and all those ideas. You can even just talk into it, so you know, it just kinda records your speaking and it just puts it into words. It’s so handy, because especially, if you’re trying to create content. – Oh, so it transcribes as well? – So that’s great. Yes it is. – I didn’t know that. – Yeah, yeah, yeah it does, and it’s so great. You can even just have like, recording notes, and it’s just so handy. Even if you have an idea, because I know that a lot of my clients struggle with that moment of, oh I have this great idea but now I cannot write, so what can I do? This is actually something that I was gong through myself at one point, because I was constantly running from meeting to meeting and I was like, damn I don’t have my notebook with me, what do I do? Evernote really changed that because now, I can just write something down, jot down a title if I need to, make notes everywhere I am, just as I said, just speak to my phone like a crazy person, and that works really really well. On a personal level, you said, I will tell you about this book that I’ve been reading recently. It’s called, The Worry Trick. It’s actually a very very interesting book. It’s something that, to be honest, it’s a book that I bought for a friend of mine to give her as a present, and then I received it, of course, and I was like, ooh actually, I’m reading it first. I’m that bad friend you know I was going through it, and it’s a very interesting book because it’s actually about anxiety and stress. I think that, especially, if you run a business there will always be an overwhelming moment, there will always be a moment where you feel stressed, where you are anxious about something. Maybe sales are not coming in, maybe you’re frustrated because you cannot write, whatever that might be. Your brain is really really great into tricking you into worrying and making that worse. Reading this book has been a little bit of an eye-opener for me, because I used to struggle with anxiety and probably till, even like one year, one year and a half ago there were moments where I couldn’t go out the house. It took me so much energy to battle through that, and it was a long path and I did it and I’m happy. To have such a book, I thought, oh wow, everybody should read this. There is always that moment when we feel anxious about something. That’s a great read. – So, the Worry Trick. – Yeah, the Worry Trick. – The Worry Trick, okay we put the links in the show, and alsoapp, Evernote, which is a tool that I use daily, absolutely love it. Also, the Worry Trick, I’m gonna read it, I’m gonna read it too. It’s definitely fascinating. Thank you very much for sharing Rosie. Now, for everyone that wants to get in touch with you, that wants to work with you, and say, I want to bewhat we call within g-decks, a bit of Rosie magic in,in my life. Where can they go? – They can actually just go to my Facebook and they can find me, Rosie Di Lecce, that’s where you will find me most of the time. You can drop me a message and if you want you can actually book a consultation with me. You can do it at bit-dot-lee-slash-call-rosie and then I’m gonna share with you what the Rosie magic is, sounds like, for some people it could maybe quite scary, but it’s actually cool. – It’s not dark magic, I can say. – I think it’s a bit of a pink magic? – You got a bit of pink magic there. – But yes, so you can just go ahead and book a consultation with me and we can have a chat and see how I can help you. – Alright, perfect, so all the links are going to be in the show notes, ladies and gentleman. Rosie, thank you, thank you very much for being on this show. Definitely, has been very powerful discussing different ways of copywriting and emotional copywriting, so thank you very much. – Thanks to you for having me, it was such a pleasure. I had tonnes of fun, thanks a lot. – Aw that’s brilliant, that’s what we are like. We like to have fun, and so if you want to have even more fun in your life make sure that you subscribe to the show if you haven’t done that yet. So you don’t miss any other amazing episode. Connect with Rosie, and until next time, remember that together we grow exponentially! Bye for now.